Arm pain, also known as pain of upper limb or upper extremity pain, can be an extremely unpleasant situation. The intensity can be different in different cases. 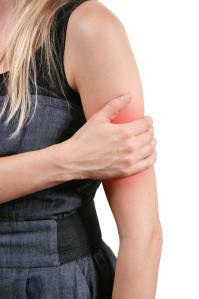 It can be unbearable or be a mild, nagging pain in one or both arms. You may experience this pain due to tissue damage, noxious stimulation of nerve fibers or an injury to the affected area. A number of underlying factors can lead to or aggravate pain in the arm. It usually happens due to an injury to the nerves, bones, blood vessels, joints and soft tissues related to your arms. Here are some common reasons why you may be feeling pain in arm. Simple sprain. When you over-stretch your arm tissues by doing more activity than you normally do, you will experience some pain and discomfort. This is usually a simple strain which is nothing serious or permanent. Tennis elbow. It is usually caused by strenuous overuse of the muscles. If you're feeling pain or soreness on the lateral side of your upper arm near the elbow, this could be a sign of tennis elbow. It is called golfer's elbow when you experience pain on the inner side of your elbow. Bursitis. It's the irritation and swelling of a bursa, a sac filled with fluid to provide cushion between tendons, muscles and joints. Usually caused by overuse or change in activity level, it is still one of the most common yet least understood of human afflictions. Careless treatment of bursitis may lead to a chronic disability. Trapped nerve. You may experience arm pain because of a squashed or trapped nerve, which is usually the result of general "wear and tear" taking place in the bones of your spine. The pain usually travels from the neck to the arms, and accompanies a pins and needles sensation. This could also happen due to cervical spondylosis or spinal arthritis. Angina. It is chest pain or discomfort usually caused by poor blood flow through the coronary vessels of the heart muscles. It produces a heavy, dull or tight pain in the chest that radiates to the left arm, jaw, neck or back. The pain gets worse with physical activity and goes away with rest. Repetitive strain injury. If your pain hits you the moment you start a repetitive task and goes away when you stop, this may be a sign of a repetitive strain injury. It could have specific symptoms like those of tendonitis or no symptoms other than pain. One of the following conditions may lead to mild or severe arm pain. De Quervain's tenosynovitis. You experience this kind of pain when the tendons on the inner side of your wrist are inflamed due to any reason. Carpel tunnel syndrome. You have arm pain due to the excessive pressure on the median nerve which controls movement and sensation in your hand. The condition can lead to tingling, numbness, muscle damage and weakness in your hand and fingers. Cervical rib. You feel arm pain when you have an extra rib that arises from the lowest cervical vertebra. The condition can cause numbness, tingling and pain. Inflammation of the nerves in your arm. Known medically as brachial and ulnar neuritis, it often causes serious pain in the right arm or in the left as well. Brachial plexus injury. After some damage to the nerves connecting the arm and the spine, you may experience the arm pain. Arthritis of the elbow. The condition can cause your elbow joint to swell, which leads to pain in the arm. Cracked bone. It is an obvious reason to feel pain in the arm, and usually occurs after a blow directly to the arm. In case you have a broken wrist or arm, the best idea is to apply ice packs directly on the affected area. Using a sling to take pressure off your arm and shoulder will help as well. To deal with a compressed nerve, you will need a therapy. At the same time, you can promote good posture, take some rest and avoid repetitive activities for some time. Keep your arm raised to help reduce the pain and swelling. Try OTC painkillers to deal with pain. It is worth mentioning that you can deal with most types of arm injuries if you start R.I.C.E measures as soon as possible. Here, R.I.C.E stands for rest, ice packs, compression bandage and elevation. These measures will reduce swelling as well as pain. Severe shoulder, arm or back pain that hits you all of a sudden and comes with fullness, pressure or tightness in your chest. You notice a protruding bone or deformity in your wrist or arm, along with bleeding or other types of injuries. Severe pain with trouble moving or rotating your arm. A sudden injury to your wrist, elbow or arm if you hear a cracking sound as well. Severe, shoulder, back or arm pain that appears with physical activities and goes away by rest. It could be a sign of angina. You have arm pain that persists for a week or so. You have pain with swelling and redness to the affected area. You have a brachial plexus injury that's not showing signs of improvement. Remember, your doctor will first listen to you and then diagnose the underlying causes of your arm pain to select the right treatment option. So, be open to your doctor and share everything about your arm injury to get rid of pain in the most effective manner. What Causes Pain in Your Armpit?